Perched atop a dormant volcano far above the roiling tropical air of the Big Island of Hawai’i sit two of the largest optical telescopes in the world. Each 10-meter main mirror is but a single part of a magnificent machine weighing in at some 400 tons that needs to be positioned with incredible precision. 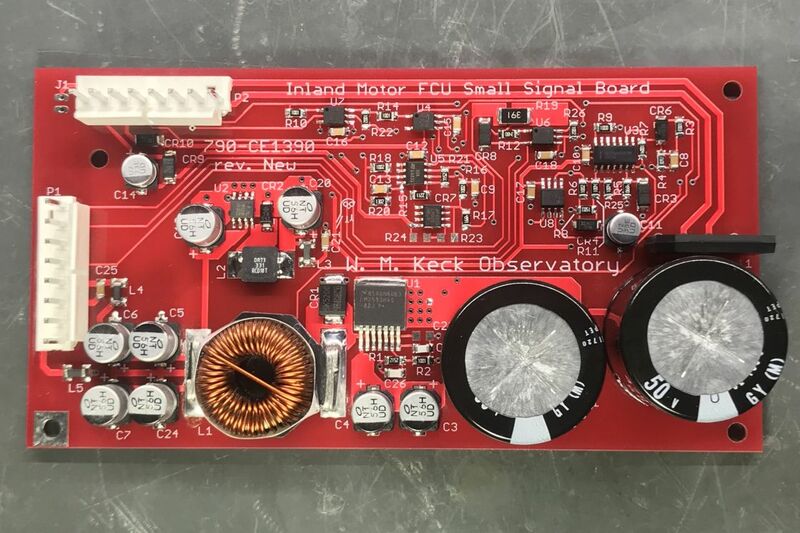 Keeping Keck 1 and Keck 2 in peak operating condition is the job of a team of engineers and scientists, so when the servo amplifiers running the twelve motors that move each scope started to show their age, [Andrew] bit the bullet and rebuilt the obsolete boards from scratch. The Keck telescopes were built over three decades ago, and many of the parts, including the problematic servo amps, are no longer made. Accumulated wear and tear from constant use and repeated repairs had taken their toll on the boards, from overheated components to lifted solder pads. With only some barely legible schematics of the original amplifiers to go by, [Andrew] reverse engineered new amps. Some substitutions for obsolete components were needed, the PCB design was updated to support SMD parts, and higher-quality components were specified, but the end result is essentially new amplifiers that are plug-in replacements for the original units. This should keep the telescopes on track for decades to come. Not to sound jealous, but it seems like [Andrew] has a great gig. He’s shared a couple of his Keck adventures before, like the time a failed LED blinded the telescope. He’s also had a few more down-to-earth hacks, like fixing a dodgy LCD monitor and making spooky blinkeneyes for Halloween. That article is about building new power supplies or “small signal boards”, not the amplifiers. I like the revision designation “New”. He’s made all the documentation available to build copies of the boards. And by the time anyone realises this stuff is actually needed, the original supplier has long since shut their doors. I imagine quite a few are stuck with, obsolete equipment, and no budget to fixing it. So creative solutions abound. Yesterday my daughter was watching the Science Channel. I briefly noticed on one of the programs an upgrade to the Keck(s) to view distant galaxies with more clarity. I don’t recall much more than that, but a web search turned up the Keck Cosmic Web Imager (KCWI). I wouldn’t really call this reverse engineering when you are starting with schematics, but a nice bit of work nonetheless. Yeah, sure, it’s a super cool job and everything, but you have to do it in a tropical paradise. At that elevation it’s hardly ‘tropical’ and often freezing temperatures. It’s also at least an hour drive from his house to the telescope. When I was working on the design of Space Surveillance Telescope in Australia the customers keep asking why we weren’t using the same equipment that was used on the proof of concept telescope that was designed 8 years prior. We had to keep explaining to them that with motors and electronics anything over 5 years would no longer be manufactured. Even if the equivalent equipment had the same specs from the same manufacturer they still didn’t like having new part numbers. It was so much FUN working for 2 different countries governments at the same time. Another telescope that’s saddled with vintage equipment are twin radio telescopes, one in the USA, the other in Chile. Someone from the Chile site came on the Vintage Macs email list looking for a Macintosh IIci motherboard. Some critical function of those telescopes requires a Mac IIci and the one in Chile had died. He didn’t know if another model of old Macintosh with NuBus slots would work, better to be safe and get an exact replacement. He was lucky it didn’t require the rare IIci version that used parity RAM, made for a DoD contract. Theoretically, anyone else could have ordered the parity RAM version of the IIci but I doubt anyone but the US Department of Defense did. Actually that pair is one of three of the largest telescopes down here. The other and the first is in CA and perched amongst its friends at the Palomar Mountain set. And the two Keck ones are the way to keep going by design. Yann Guidon / YGDES has updated details to Mains protection box. amidar liked OPEN Power (Prototype 1). ap-tech liked Sawppy the Rover remake. Ana has added a new log for Automated Circadian Bathroom Light. Mike Szczys liked Big 7 segment display. amidar liked Spin/Drive: Automatic potentiometer tracer. DevTown liked Soda Bottle Display. Dustin Kimmel has updated the log for Dev kits for a team project. Fabrizio Guglielmino liked ESP32 WiPhone.